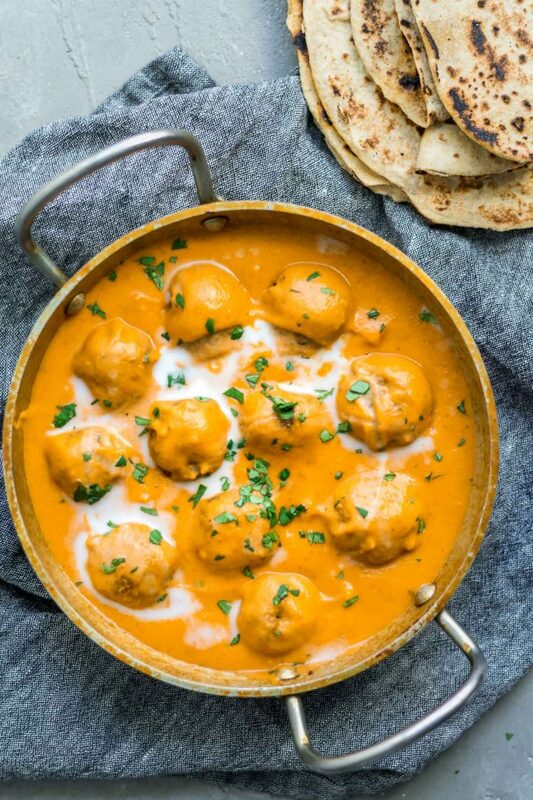 If malai kofta isn’t one of your top 5 Indian dishes you probably fall into one of these categories: you’ve never been to an Indian restaurant*, you’ve been vegan or lactose intolerant your whole life, you don’t like rich foods, or you’re really bad at ordering. Kofta are meatballs, and there are variations of them from the Balkans and Middle East through South Asia. In this dish they are typically made with potatoes and paneer (a fresh farmer’s cheese). Malai simply means cream. 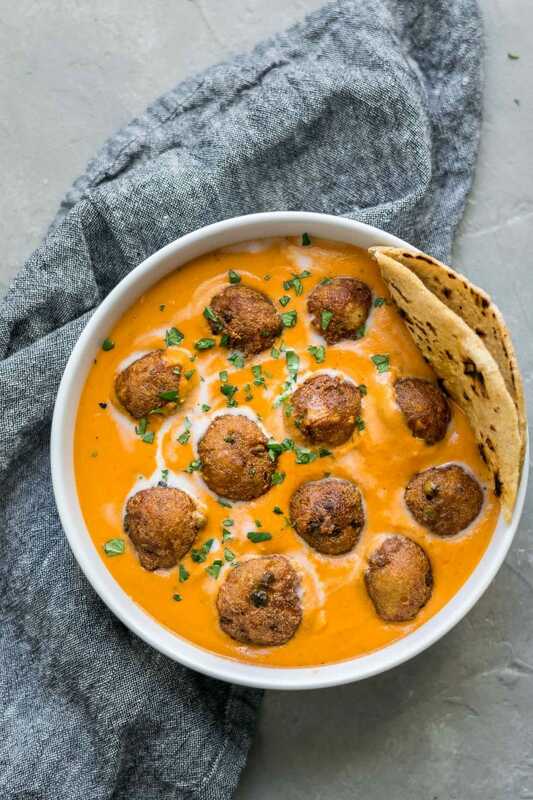 In this recipe we make easy swaps for those two non-vegan ingredients for the most delicious, richest tasting, better-than-restaurant style malai kofta. Sound like dream? Because, it is, and you should be eating it already! 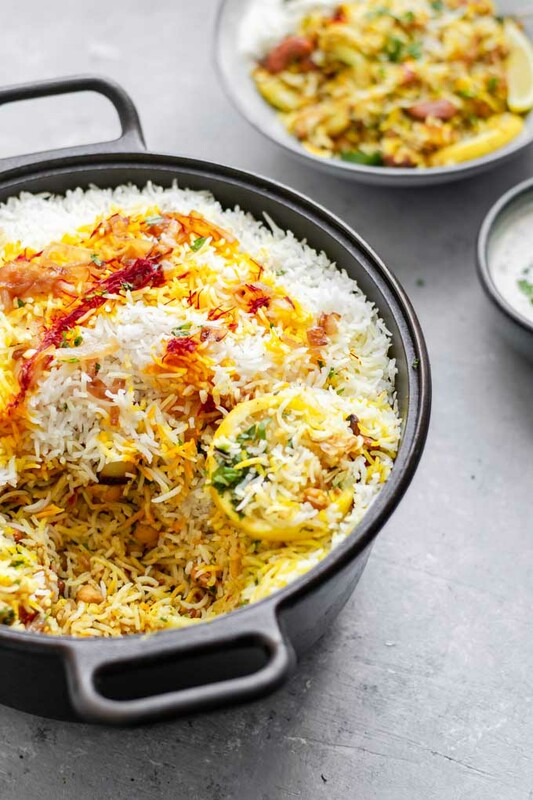 *most Indian restaurants outside of India specialize in North Indian cuisine which is heavy in dairy with a lot of dishes using cream and/or ghee. South Indian cuisine, where you’ll find delicious dosa and uttapam, are typically more vegan friendly as it’s more traditional to use coconut milk and oil. I didn’t grow up eating kofta of any kind. It wasn’t part of my grandmother’s regular repertoire and my parents shied away from deep frying food and I don’t recall any baked versions. The first time I had kofta was at age 11 when we spent several months living in India. While there we were invited over to eat in many peoples homes and I had a whole new world of Indian cuisine opened up to me. 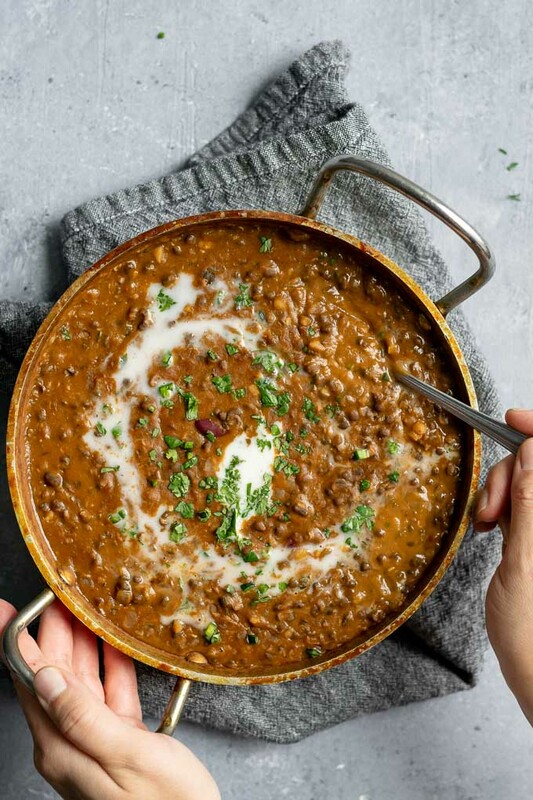 It was also my first exposure to kofta and a black lentil dal I still dream about that must have been similar to dal makhani but it wasn’t quite that (I do have a great vegan dal makhani recipe as well as this delicious urad dal recipe though!). Kofta quickly shot up to one of my favorite dishes, because, I mean, who wouldn’t love fried potato dumplings?! But going vegan meant no more malai kofta at restaurants. Which I am just fine with, because I can make it at home and let me tell you, it’s even better! The kofta themselves are pretty easy to make vegan. While my mother-in-law makes hers with a potato, carrot, and green beans mixture, I wanted to capture the decadence of the paneer-potato dumpling. Tofu is a great substitute for paneer, it’s essentially made the same way as paneer. The curds are separated by adding an acid to the milk (whether soy or cow’s), and then strained and pressed. To use tofu in the kofta, mash them up really well in your hands until it’s almost a smooth consistency and there are no large chunks. Pro-tip: take the tofu out of the fridge a bit before mashing otherwise your hands will get super cold! Tofu is pretty bland on it’s own, so I add a bit of lemon juice for some acidity. Potatoes are boiled and mashed, and that’s what holds the dumplings together. Corn starch (or substitute arrowroot or tapioca starch) helps absorb some of the extra moisture from the tofu and potatoes and makes the balls nice and crispy when they fry (or bake). Minced cilantro is added for flavor, and don’t forget to use the stems! There’s so much flavor in cilantro stems, and when they’re minced and added to the dumplings you won’t even notice them. Garam masala makes spicing the kofta a cinch, and I love the addition of juicy sweet green peas. The kofta are most traditional when deep fried. The soft dumpling mixture holds its round shape really well and you have a crispy outside and soft, melt in your mouth interior. Deep frying is not complicated at all, but it does require a lot more babysitting. You have to work in batches and keep a close eye on the temperature of the oil. I’m not going to lie, deep fried is my favorite way to enjoy them. Pan frying doesn’t quite do it for me. The dumplings are soft for panfrying and don’t end up with that nice even crispy outside. Plus they’re still absorbing oil, so you might as well be deep frying. Baking uses less oil, with just a thin coating around the dumplings. The high heat is also able to crisp up the outside (albeit, less thin and crispy than frying) while the insides stay soft and creamy. Baking the kofta is also rather hands off, even if it takes about the same amount of time as frying the multiple batches. You can stick them in the oven and walk away, only returning once in to flip. I’ve included instructions both for deep frying and baking so you can decide for yourselves! The golden cream sauce made to accompany the kofta is super easy and has the richest flavor. Onion, garlic, ginger, tomatoes, cashews, and spices are simmered until soft then blended until smooth. Coconut milk is added for the cream. The mild coconut flavor is mostly overpowered by the tomato and spices, and it makes the sauce extra luscious. Malai (cream) is super rich, so to most closely substitute for it you can use only the cream from the can of coconut milk–the creamy and thick white stuff that separates to the top of the can. It’s really good that way, and keeps the sauce nice and thick, but I’ll usually dump in the whole can because otherwise I end up wasting the coconut water. If you can find a can of coconut cream it’s perfect to use in this recipe. The sauce will cling to the kofta and thickly coat them when poured overtop to serve. The final touch to the curry sauce is kasoori methi, or the dried leaves of fenugreek. It gives the curry that authentic and restaurant flavor. It’s one of my favorite ingredients and one you should pick up if you don’t have it already! But if you can’t find it, you can substitute some fenugreek seed (add it along with the rest of the spices at the beginning to simmer and soften). Fenugreek seeds have some of the same smell, but won’t replicate the flavor perfectly. It will still be excellent though. This malai kofta has it all. A rich tasting, lusciously creamy curry sauce. Sneaky protein filled dumplings. 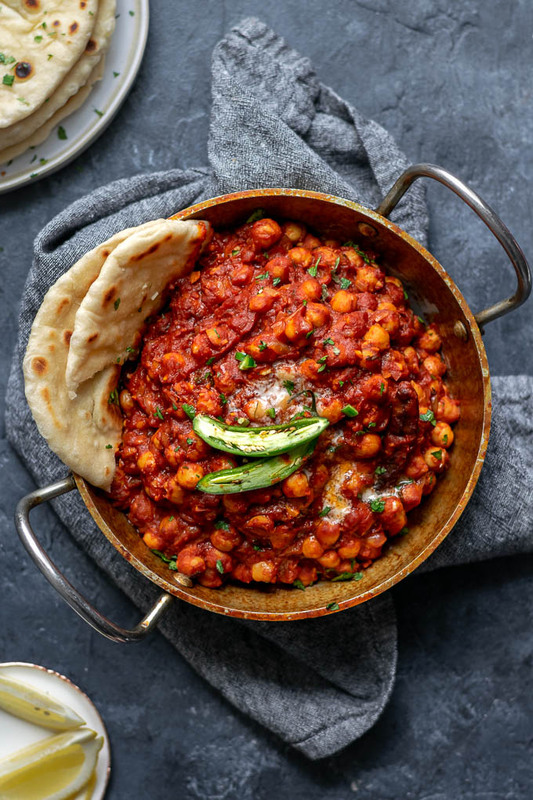 It’s so delicious served with basmati rice or flatbread, with some roasted curried cauliflower on the side. One way to easily sneak in a little extra vegetable into the recipe is to add half a pound of baby spinach or chopped spinach into the sauce once it’s blended along with the coconut milk and methi. You’ll need to turn the heat over medium-low, cover, and stir occasionally until the spinach cooks down to almost nothing, another 10 minutes. Extra bonus is to throw in some plain roasted cauliflower at the very end (the curried cauliflower would be more strongly flavored than you’d want). Adding veggies right into the sauce makes this recipe a complete 1-dish meal. I hope you guys love this recipe! It’s sure to impress anyone, with it’s restaurant quality flavors and presentation. 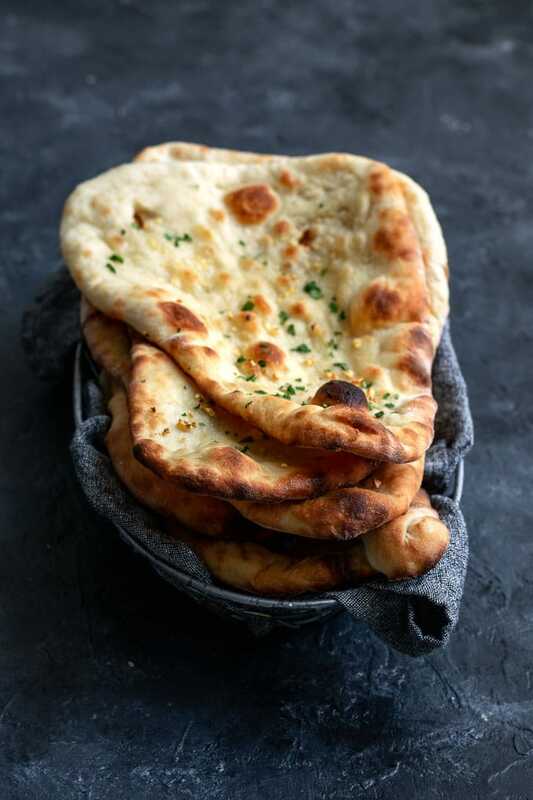 If you’d like to serve it with bread an easy shortcut is to buy frozen paratha (check the ingredients but plain paratha is usually vegan) at an Indian grocery store. Maybe someday I’ll perfect my chapati recipe enough to feel comfortable sharing it :). If you make my vegan malai kofta, please comment and rate the recipe below. I’d love to know what you think! As always, don’t forget to tag your recreations @thecuriouschickpea and #thecuriouschickpea on Instagram, or share with me on Facebook! 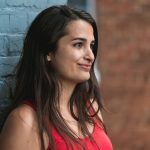 As a little aside, if anyone is on Pinterest, I’m finally on there and would love to connect with you! Keep the dumplings separated from the sauce until serving. Leftover dumplings are best reheated in the oven until crispy, then spooned over with sauce. If microwaving leftovers or putting sauce on in advance the baked kofta hold up a bit better. If you bake the kofta, they won’t look exactly like this. They don’t get the same beautiful, even golden color and usually collapse a little into more of a puck shape while baking. Still delicious though! If frying the kofta, using vegetable shortening will produce the least greasy feeling dumplings, as it turns solid as it cools. I’ll often use a mixture of canola oil and shortening. Just make sure to double check that the fat you use is stable to at least 400 ºF. The recipe isn’t spicy as written, with just a subtle hint of heat from the cayenne. Feel free to add more if you want it spicy, or add some dried Indian red chiles to the sauce after blending. Keep in mind that the coconut milk tempers the spice, softening any heat. Potato and tofu-ricotta dumplings are fried or baked until crispy on the outside and soft inside, then served with a flavorful curried tomato cream sauce. Enjoy with some Indian flatbread or basmati rice. First cook the potatoes for the kofta. Peel and cut the potatoes in half, then place them in a pot and cover with water. Place a lid on the pot and bring the water to a boil over high heat. Turn the heat to medium and let boil for 10-15 minutes until the potatoes are fully cooked and easily pierced with a fork. Drain the hot water from the potatoes, mash them until smooth, and set aside. While the potatoes are cooking, start the curry tomato cream sauce. In a large heavy bottomed pot add the onion, canned tomatoes and their juices, cashews, garlic, ginger, garam masala, turmeric, cayenne, and salt. 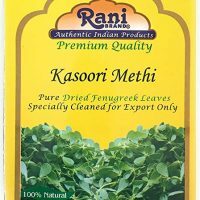 If you are using fenugreek seeds instead of kasoori methi, also add the fenugreek seeds at this point. Cover the pot and bring it to a simmer over medium heat. Let simmer covered for 15 minutes, stirring occasionally. Transfer the onion and tomato mixture to a blender and blend until smooth, making sure to vent so hot air doesn't build up in the blender. Alternatively, you can use an immersion blender, but the final sauce will not be as silky smooth. Pour the creamy mixture back into the pot and add the coconut milk, reserving ~1/4 cup back to serve and crush the methi in your fingers and add to the pot. Mix together and cover the pot and set aside until the kofta are ready. In a large mixing bowl, mash the tofu by squeezing it in your hands until it's creamy and no chunks remain. You want to have the texture of ricotta. Alternatively you can blend it in a small food processor until smooth. Add the mashed potatoes to the mashed tofu along with the corn starch, minced cilantro, lemon juice, garam masala, and salt. Mix together and test the consistency by forming some into a ball. It should hold together. It can stick to your hands a little, but if it is very sticky or too wet and falling apart, you can add a bit more corn starch. This can vary depending on what brand and variety of tofu you use, but the recipe is quite flexible. Mix in the frozen peas. Shape the kofta mixture into heaping 1 tablespoon portions and roll into balls or into a football shape (a torpedo). To fry the kofta: Heat about 2-inches of high heat safe oil in a heavy bottomed pot over medium-low heat. Test the oil either with a thermometer until it is 325-350 ºF or you can test with a small piece of the kofta mixture: the oil should bubble/boil vigorously around it and the kofta should float to the surface fairly quickly after being dropped in. When the oil is heated fry the shaped kofta in batches, being careful not to overcrowd the pan, until the kofta is a beautiful dark golden brown color, flipping halfway through for even cooking. This should take 5-10 minutes, depending on the temperature of your oil, how much oil you have heated (more oil means the temperature is more stable when you add the kofta), and how many kofta you add at once. When the kofta are cooked, transfer to a paper towel lined plate with a wire spider strainer. Repeat with remaining batched of kofta until all are cooked. To bake the kofta: Preheat the oven to 425 ºF. Line a baking tray with parchement and spray or brush with oil. Arrange the shaped kofta onto the baking tray so there is 1/2-1" between each kofta. Spray or brush the tops with oil. Bake for 30-40 minutes, flipping after the first 15-20 minutes, until both sides are golden and the edges of the kofta are crispy and chewy. It's normal for the kofta to lose their shape a little and flatten when baked. When ready to serve, pour the sauce overtop the kofta (only use what you will eat in one sitting, as the kofta get soggy once in the sauce), then pour the reserved coconut milk over top the kofta. Garnish with cilantro if desired. Enjoy with Indian flatbread and/or basmati rice. Love Indian food? Consider making some of these recipes! Can’t wait to try this one Eva. It looks and sounds phenomenal :). Just made this tonight and it was fantastic! My husband loved it. I faced a few challenges (I live in Vietnam, so that’s not unusual), I didn’t have a scale so I had to guesstimate on my potatoes (which were all on the small side) and my tofu. Also didn’t have fenugreek, so I had to omit that altogether. That being said, it came together great! We had a ton of sauce left over, so we just froze that up and are keen to serve it with some veg next time we need a super quick meal. Thanks so much for the recipe! Looks and sounds fantastic! Should the tofu be drained and pressed before crumbling? Drained yes, but I’ve tested with firm, extra-firm, and a super firm tofu and it has worked every time! For tofu with more water in it (like the firm) you may find you need to add a bit more starch, especially if you’re baking it. The kofta are pretty forgiving though! Thank you! I just made this last night and it was AMAZING. My non vegan friends loved it too! Thanks for the recipe! That sauce is lick the plate good. Hi there, this recipe sounds amazing. I’m looking for a recipe that I can prepare in advance for guests, so I’m wondering if you think I can prepare the sauce and the kofta in advance and then oven heat the fried kofta and reheat the sauce later in the day? I think our guests will arrive in the middle of the afternoon, so I’m worried I’ll be distracted so thought if I can prepare ahead of their arrival that would be best. 😀 Thank you! Yes! Definitely make the sauce in advance, you can even do so the day before. And you can fry the kofta beforehand just keep them separate from the sauce. Reheat the kofta in the oven until they’re crispy again (at 375 or 400 deg F). And then combine the two parts to serve. This is how we have enjoyed the leftovers on many occasions! Such an amazing recipe! Best Indian dish I’ve made yet! (Even though I forgot the peas). Can’t wait to try your other recipes. This sounds amazing, and I love your photos! What would you suggest as a nut free alternative to the cashews? I would probably just leave them out. There is plenty of creaminess from the coconut milk. Or you could replace the coconut milk with a can of coconut cream. Oh wow! This recipe looks delicious! I love how you subbed the tofu for the cheese! That is clever! I will be adding this to my list of recipes to make! I can’t wait to try it! 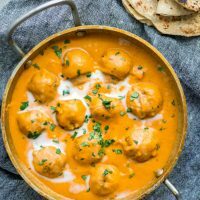 I just made Malai Kofta for the first time a few weeks ago, this recipe looks fabulous! Thank you! I’m so glad I came across your blog! I am always looking for new healthy vegan and gluten free recipes to try. That’s too bad! The starch is a necessary ingredient for binding, the dumplings would be too soft otherwise. However you could try to substitute a different starch (tapioca starch, potato starch, arrowroot powder) or even try a flour or breadcrumbs. Glad you enjoyed the malai sauce! This is out of the world fantastic! I made some changes – no cashews, less cornstarch and rolled dumplings in panko before frying – they were terrific. Better than anything I’ve had eating out. Made them twice in the last month. The recipe title mention ricotta, but it does not appear in the ingredients list? My family loves this recipe! 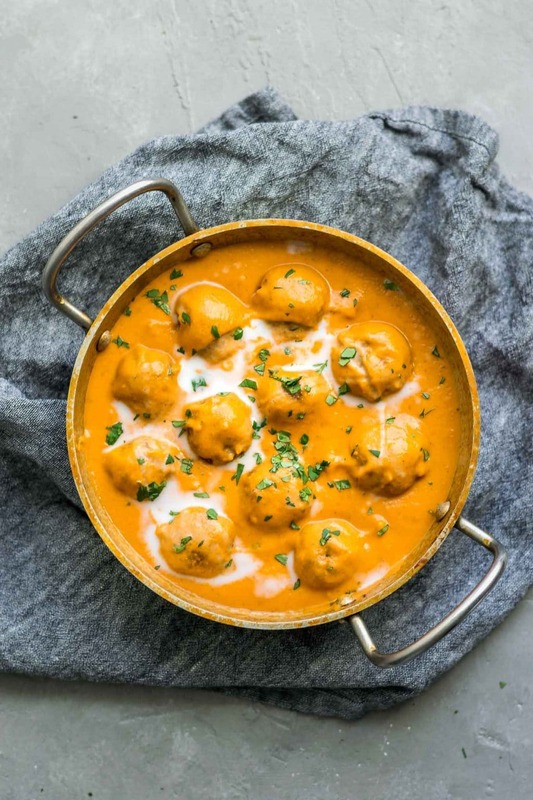 Aside from Vegetable Korma, this Malai Kofta is my kids favorite dish! I add raisins to the veggie balls to sweeten it up. Tonight will be my third time making this recipe! It’s our go to Birtbday dinner recipe! Thank you so much! I’m so glad! Thank you for the nice review! I really want to try this durng the weekend! But I want to ask if the kofta balls are mixed in a food processor or just mixed by hand? If mixed in a food processor it will result in smooth texture throughout the ball, but then I don’t get the specific point of frozen peas. So maybe they’re too be left whole in the mix? Thanks! Hi Anna, I combine the mixture by hand! The option is to process just the tofu in the food processor to make a thick tofu cream or to mash it by hand where it won’t get as smooth but still works just fine (and saves you the extra dishes!). Then once your tofu is mashed you add the potatoes, peas, starch, etc and just mix it all together. Hope that makes sense! I want to attempt these in my air fryer. I just made some wonderful falafel in it, which worked out great, so I began thinking, why not malai kofta too? I love malai kofta, and really miss not eating it since becoming vegan. Your recipe has great comments, so I trust your spice mix! Often Indian recipes online don’t taste at all like restaurant food, but yours looks great! Hi Doug, I believe I have had people successful make this in an air fryer, so it should work! And since baking works I’m guessing the air fryer would have no problems. I hope you enjoy the recipe! If for any reason the flavors feel flat just try adding a bit more salt and extra lemon juice, both will enhance the spices, but especially the salt! Thank you so much with this recipe! I made the sauce today (with potatoes, peas and paneer instead of the dumplings) and I loved it. As a vegan, a major miss has been Malai kofta [that and shahi paneer too 😉 ] Just finished eating this for dinner! It turned out phenomenally. We added a bit more cashews for extra nuttiness. The winning aspect was the kofta! The consistency was perfect. Thanks so much for blessing our taste buds with this dish! I’m sitting waiting for the kofta to bake and if they aren’t finished soon the sauce is going to be gone! It is absolutely amazing! We like things a little spicy in my house so I added some extra cayenne pepper. I could seriously eat it all! Can’t wait to taste the kofta! Hi Eva, thanks for the great recipe! I just ate it all and it was so delicious and creamy and tasty… lovely! I did have an issue with it though. The dough for the koftas came out way too wet and I had to add a lot more cornstarch. I’m thinking this is because I don’t have a scale so I had to estimate my tofu and potatoes, or because I processed the entire dough mixture instead of mashing the potatoes by hand. I deep fried the koftas and they stuck to the bottom of the deep fryer basket. Also, some of them burst open with a loud pop! I suppose the pressure from the heat became too much for them? The sauce came out well. It was easy and came out tasting pretty similar to sauces I’ve had at Indian restaursnts even though I couldn’t find the fenugreek and omitted it. Do you have any other recommendations for fixing the mistake I made ? This dish was absolutely amazing!! Thank you for sharing! Thank you for this recipe!! I have made it on 2 occasions and has gone down a treat both times. I had a friend who would usually turn down a meal without meat say it was the best curry he had ever eaten. Was very excited to try this tonight, but for some reason all the kofta completely fell apart when I fried them. Before I put them in the pot they were perfect little balls, so it should have worked. I ended up throwing all of it away and just buying veggieballs from the store. Do you have any idea what could have gone wrong? I really want to make this recipe work! I’m sorry to hear that! My best bet is that the mixture was just too wet (and possibly the oil wasn’t hot enough). If the mixture was too wet you can do two things: press the tofu to remove excess water and/or add more starch to the mixture. Did you deep fry? Pan frying doesn’t work well with this recipe as the kofta are too delicate. Also during deep frying you have to be careful to not crowd the pan and not jostle them too much. Until they form a crispy outside they are a bit delicate, but this is what gives them that lovely final texture of a creamy interior and crispy exterior. And if you do run into difficulties you can always save the mixture and form it into balls and bake–baking saves all! Hope that helps! Hey, I made this last night and it was upset delicious. However, I tried both baking and frying the kofta and they didn’t turn out writhe times. When frying they just kind of stuck to the bottom of the pan and mostly fell apart even though I did roll them into a ball/little patty. When I baked them the insides were mostly hollow. They browned on the outside but the insides must have leaked out. Would I just need to add more arrowroot powder and make them firmer? Thank you for this amazing recipe! I read the other comment about adding more arrowroot powder so will try that! Hi Ashely, that’s so strange that they turned hollow during baking! For frying they do need to be deep fried and not pan fried so I’m not surprised they stuck to the bottom. Adding extra starch/arrowroot should help firm them up though. How much starch you need will vary with tofu brands and how firm they are (i.e how much water is pressed out) and also how much water your potatoes absorbed while cooking—you want them tender but not mushy. I hope you give them another try! it is truly *amazing* !!! I was skeptical with no frying, but seriously this is awesome, thank you! A vegan ricotta should work as well. You’ll just want to adjust the starch if needed so that the dumpling mixture isn’t too soft. 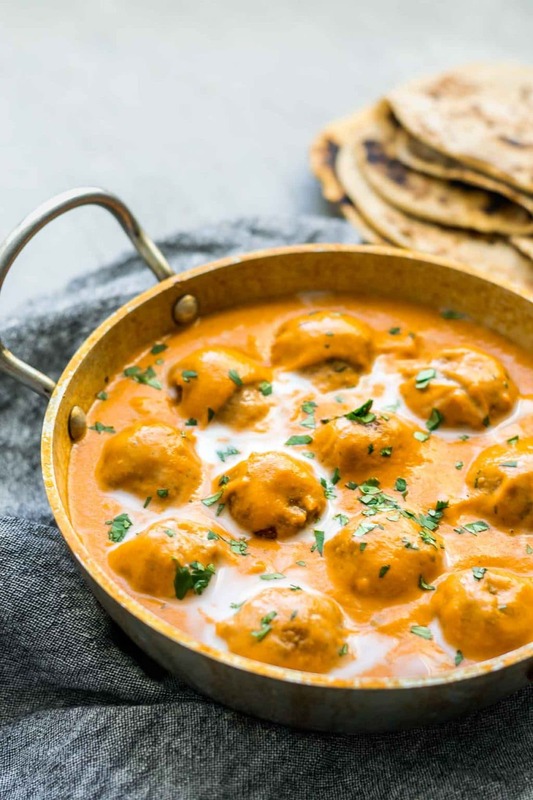 My husbands favorite Indian dish is malai Kofta but I am allergic to dairy. I made this last night and everyone in the family LOVED it! so tasty. I fried the dumplings. I think I may serve them on the table to be made one at a time because that first one- with the outside crispy and the inside soft was so amazing. After a bit the sauce makes them soft. Still good…but man that first one! This was soooooo good! It’s going into the regular dinner rotation. Thanks! I made these yesterday since we did our official Christmas dinner a few days ago. These are delicious! And the sauce! To die for! I want to put it on everything from now on! I just made this tonight! We loved it. All had seconds. I doubled the cayenne based on the author’s comments but otherwise did the recipe as directed. It took me quite a bit longer than the recipe indicated, but it might go faster the next time. I may make the meatballs the day before another time. But there will be a next time! I made a half recipe tonight and it turned out great. I did bake the koftas rather than frying, but otherwise (almost) followed the recipe as written. I did soak the cashews, as I worried they might not blend well. i also sauteed the onion a bit before adding the tomatoes. Lastly, I added some roasted jalapeno (I had half of one in the fridge I needed to use) and some red chili pepper in place of the cayenne and was quite happy to have a very spicy tomato gravy.